You have to sort out the kitsch from the classic. This is not an exhibition of cheap tourist art found haphazardly around Moab. With nearly 20 large-scale paintings, The Continuing Allure highlights painting’s “rock” stars. 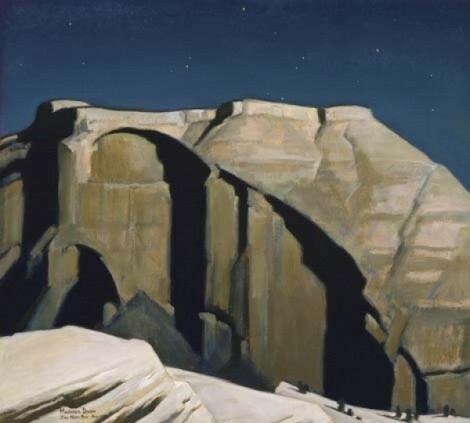 In many ways, these pieces are more modern than expected—modern artists painting an inherently modern landscape, reduced to the bare essentials of the desert—very cubist, indeed. Other showings include the nearly cubed work of post-modernist Buck Weaver, and the light traces of human impact in works by Mark Knudsen. This exhibit will appeal not just to art aficionados but also to those interested in geology, history and tourism. It marks the existential experience of the desert, minimalism and, in a way, the personal insignificance illuminated by vastness.